Our expertise in cleaning microfiber materials helps you achieve the highest hygienic standards possible while keeping costs and downtime to a minimum. The special mop washer extractor includes a special wash program package (three mop programs and four general programs), special heating elements, a special inner drum and an electric drain valve for quick drainage. Load the used mop heads into the mop washer. 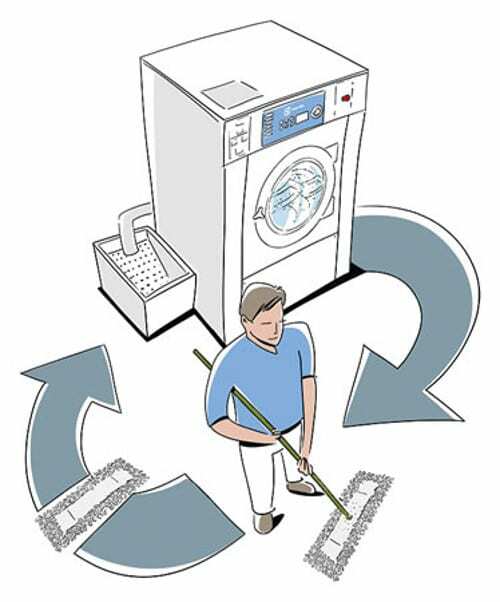 Select the preferred mop program and start the wash process. The mop heads are washed and prepared exactly to your needs – including saturation with the agents of your choice.